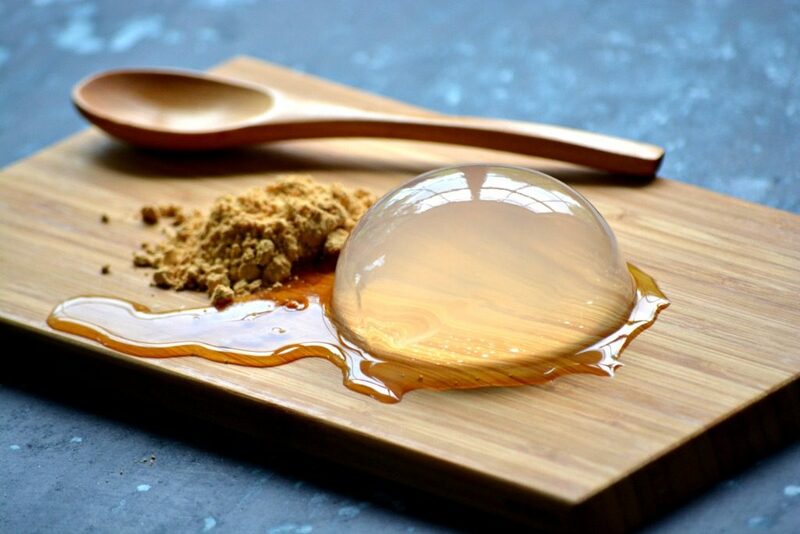 The Japanese Raindrop Cake that took the Internet by the storm: Mizu Shingen Mochi. 3 ingredients. Vegan. Gluten-Free. Yumm! We’ve all seen the Buzzfeed videos of a magnificent water cake that’s wildly popular in Japan. It looks like a water drop that can be held in your hands, bitten into, but dissolves into water within just 30 minutes of being served. Isn’t it fascinating, that it comes with it’s own self-destruct mechanism. If it’s not eaten in 30 minutes, you don’t get to eat it at all! The Kinseiken Seika Company are the proud creators of this simple yet magnificent dessert. It is made from fresh water taken from the Japanese Alps. The water sourced from the mountains is so tasty that it needs no other flavouring. Mizu in Japanese means ‘water’, Mochi is a kind of dessert made with glutinous rice flour and Shingen Mochi is a trademarked dessert made by the Kinseiken Seika Company. Because of the delicate temperament of this particular dessert, it is sold in very few of their stores, cannot be reserved in advance nor taken away from the store. All this ads up to a long line of customers outside the two stores that do sell it, every singe day! 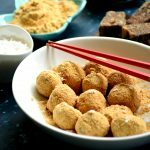 For those of us who cannot travel all the way to the land of the rising sun to savour this water cake, or afford the exorbitant $8 charged for it in New York, the only remaining course of action is to make it ourselves. In theory, the water is solidified using agar agar, set in a spherical mold and as easy as it sounds, it took me no less than 7 tries to get it right despite following recipes to the letter! No wonder it is so popular everywhere! Rarity and unattainability truly adds to the allure of an object. Living in the city, getting our hands on clean, natural spring water is a little hard, but try using bottled mineral/spring water instead. When I tried using filtered water, it resulted in a slightly cloudy product with no detriment in taste. – Use filtered water, or even better, bottled spring/mineral water. The clearer the water, the more transparent the end result is. 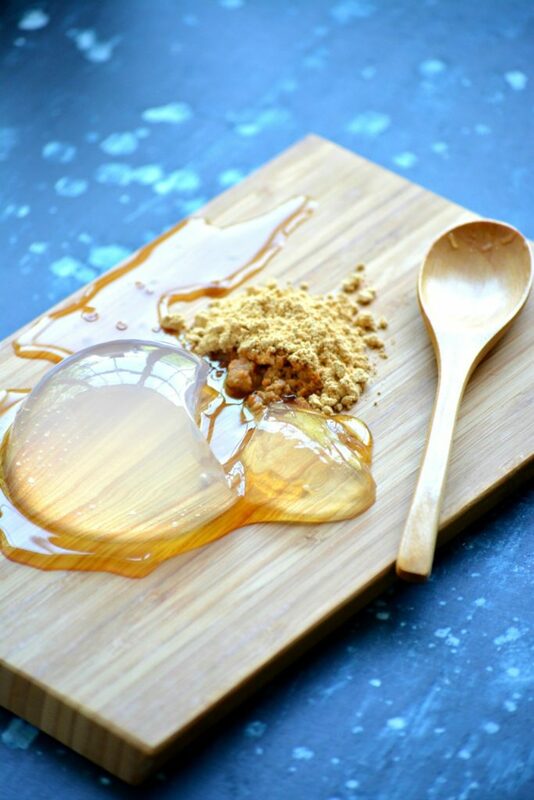 – Dissolve the agar agar in the water, and bring it to a rolling boil for a good 1 minute. – Let cool completely, before pouring it into molds. – When you see the cooled liquid, you should see it clear, without any pooled agar settlements at the bottom. If you see agar sitting at the bottom, boil it for a minute more, stirring constantly. 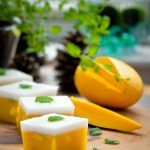 – Agar sets at room temperature, but since this dessert uses such small quantities of the stuff, you will need to refrigerate it overnight or for at least 5-6 hours. Overnight is safer. 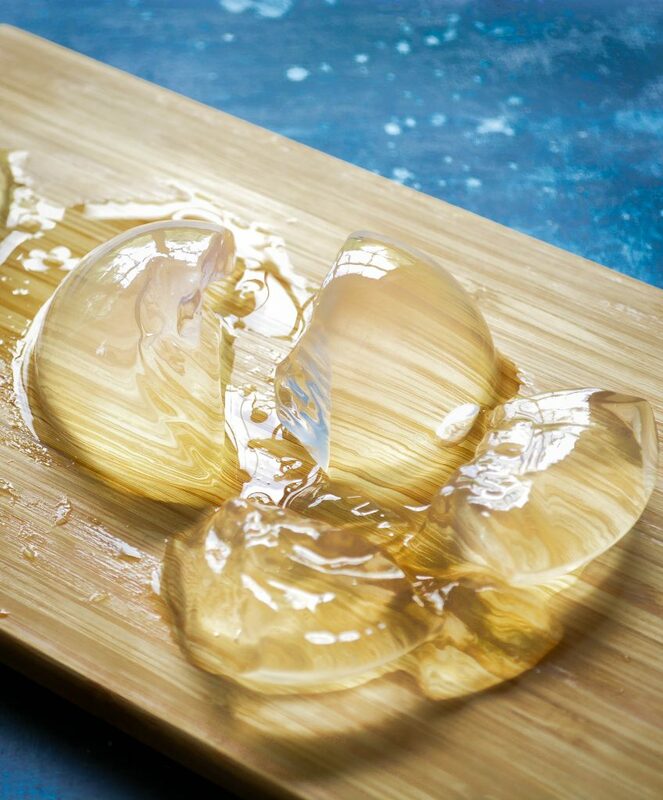 – A lot of tutorials suggest using a spherical mold, but the agar bond is so weak, that the sphere does not ‘sit’ well without falling apart (see picture below). So use a semi-spherical mold instead with a flat base. It’s much better for maintaining the structural integrity of the delicate dome. – Serve and eat as soon as it is un-molded. Refrigeration after un-molding does not prevent it from turning into a puddle of water. – If your attempt failed, don’t throw away the jelly. Reheat in a saucepan till it ‘melts’ back into liquid. If the problem was too much agar (firm, opaque jelly), add more water. If the problem was that it did not set, add a pinch more agar. Your trial is a success if 1) it unmolds without breaking 2) jiggles when handled 3) starts ‘weeping’ as soon as it is unmolded 3) Looks almost as clear as glass 4) returns to a puddle in 30 minutes. 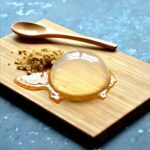 The Mizu Shingen Mochi is served with a side of Kuromitsu (black sugar syrup) and Kinako (roasted soybean powder). 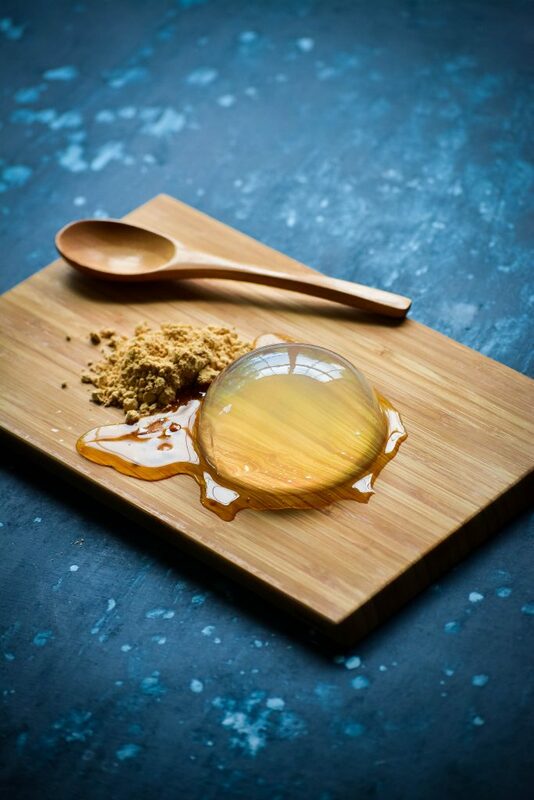 If you cannot find Kuromitsu, you can substitute with honey or light jaggery syrup. 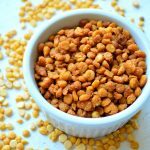 And Kinako can be substituted with roasted split chickpea (bengal gram) flour. Or even better, roasted peanut powder. Honestly, it’s very hard to describe. The jelly itself is tasteless, but the texture is quite fascinating! When you slice it, it is jiggly and hard to get onto the spoon, and considering that I used a wooden spoon, harder! So take note – don’t use a wooden spoon and for goodness sake, no chopsticks! Once you eat it, it breaks apart in your mouth, almost bursting into cool, crisp water again. What gives flavour to this ‘cake’ is the Kuromitsu and Kinako. If you are a South-Indian, and you’ve had sweet kozhukattai with jaggery and coconut, eating this feels like that…. Except, in place of the floury dumplings, there’s translucent, edible water. This was the most fun kitchen project I’ve ever undertaken, and despite the several heart wrenching failures, I still kept at it, which made the successful attempt that much sweeter. I do hope you try it, and let me know your Mizu Shingen story in the comments below. – When taking the agar agar, make sure you level the spoon. No heaped, no casual piling, but a definitive, packed 1/4 teaspoon. – I used this spherical mold from Amazon here. Combine the water, agar and sugar in a small saucepan. Stir to dissolve as much as possible. Bring to a rolling boil, and let it boil for a full minute as you stir continuously. You should see no cloudiness, no undissolved granules, just clear liquid. Pour into a semi-spherical mold. If using a spherical mold, do not close using the lid that came with the kit, rather just cover with cling film. We want a flat base for the sphere. Refrigerate overnight or for 5-6 hours at least. Run a small toothpick around the edge to loosen it up. Sit the mold in warm water for a few seconds to loosen the base. Unmold carefully and serve immediately with a side of Kuromitsu and Kinako. 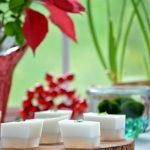 Another great way to add a very light, delicate flavor to water cake is to add a little orange or rose (or other if you have it) water. Just be sure to subtract the same volume of plain water. To add more visual appeal, you can add a small amount of fruit (strawberries are popular) or edible flowers (small rose blossoms or rose petals are popular) to the mode when you refrigerate. It takes a bit more skill to remove from the mold, so I i wouldn’t do this as a first (or probably even fifth LOL) go at it. That is a GREAT idea, Walter! I have both orange and rose flavors with me. Thanks for sharing it with us here today! Thank you for this. I can’t wait to make it for my next dinner party. 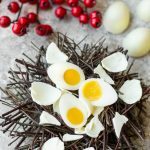 Do you think it can be prepared a few days ahead of serving? If so, would they need to stay in their molds? Thanks in advance. I think it should be fine, as long as it is in the mold, although, I would remove one and test to make sure it’s set properly. So that you can make another batch if it is not up to code. Good luck! 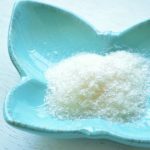 Hey Aniev – agar is extremely light, and usual kitchen scales have a hard time reading such small quantities. Since the entire recipe is given in cup measures, please go ahead and use whatever measuring cups you have at hand. It should translate to the right proportions. The problems only arise when there’s a mixture of cup+ weight measures in a recipe. Hello, I wanted to make this, so I got all the ingredients. Now, while making I notice that my agar agar isn’t a powder but this strange papery plasticlike thing. How do I fit that into a teaspoon? 😵 Did they give me bad agar agar or something? I wonder how it’ll turn out. Thank you very much for the comprehensive post. Wow I would impress a lot of people with this delicacy. Yup, you sure would Rose! Good luck! Read it twice to make sure I get all your points! Great experiment!